Social Security disability benefits are paid by the federal government to former workers who have become disabled. Depending upon such factors as the length of the marriage and when the benefits were received, these funds may be considered marital or separate property in a Michigan divorce. The right to receive Social Security benefits in the future can also impact other aspects of a Michigan divorce case. In Michigan, the ongoing right to receive Social Security disability payments is not considered marital property, so the court will not divide these benefits between the parties or order that some portion of each future disability check be paid to the other spouse. Disability benefits that were received during the marriage, however, are considered marital property. As with other forms of marital property, Michigan divorce courts will divide these funds equitably between the parties. Social Security disability benefits received during the marriage, along with other marital property, will be fairly divided between the divorcing spouses. This does not mean, however, that the division will be equal. The court will consider factors such as the cause of the divorce, who initially acquired the property, the length of the marriage, and which spouse has the greater need, including whether one spouse is disabled and unable to work. Although one spouse's ongoing disability benefits are not marital property to be divided up or awarded to the other spouse by the divorce court, the non-disabled spouse may be able to obtain his own benefits directly from the federal government. If the marriage lasted at least 10 years, and other legal prerequisites are met, a divorced person may qualify for her own Social Security disability and retirement benefits based upon the work history of her ex-spouse. Although the ongoing right to disability payments is not marital property, it can and does impact other aspects of the divorce. The court will consider a spouse's right to receive Social Security disability payments as a form of income and part of that spouse's financial condition. As a result, the right to disability payments can influence such things as how the judge divides marital property and whether spousal support or child support is ordered and in what amount. Contingent liabilities are potential debts where a party's responsibility has yet to be determined. 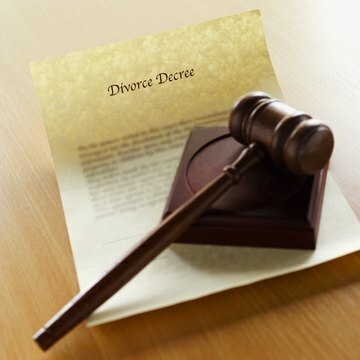 At the time you and your spouse separate pursuant to a divorce, you may have pending situations where the outcome will depend upon future events, leaving you unable to determine for sure the amount you will owe or even whether you will owe anything at all. When couples consider divorce, one of the first questions that usually arises is who will get what. Couples are often confused about such matters as pensions, disability pay, Social Security benefits, and other forms of income which may have accrued during the marriage but will continue to be paid after the divorce is final. When it comes to veterans disability pay, some aspects of what happens during divorce are crystal clear nationwide. Others, however, vary from state to state.